Generally, I am not a superstitious person. If I break a mirror, I do not really believe I will have seven years of bad luck. I will simply have broken shards of glass to sweep up and the expense of buying a new mirror. Assuming I do not cut myself in the process of breaking or picking up of the pieces of the mirror, it is simply a minor inconvenience not the commencement of seven years of doom and gloom in my life. I tend to be fairly logical, sometimes even too logical for many people. Throw logic to the wind, however, when it comes to my beloved Boston sports teams. Open the window and let the sports superstitions in. Merriam-Webster defines superstition as: “a belief or way of behaving that is based on fear of the unknown and faith in magic or luck; a belief that certain events or things will bring good or bad luck.” So I ask myself why do seemingly logical people such as myself, people who believe in hard work and preparedness not magic or luck, embrace the illogical when it comes to wins and losses in the sports arena? Sports fans want to feel a connection to their team and every good team member does their bit to help their team win. As fans when we are at a game, it is easy, we scream, yell and cheer our teams and players on to victory. Fan energy can change the outcome of a game and help a team or player rally. The fans can play a part, albeit a small part in a team’s victory. From the comfort of our own homes, however, it is not that easy to feel connected to the outcome of a game and our beloved sports team. Some fans may yell, cheer and curse at the TV. I do rather loudly and vehemently on a regular basis but my yelling and cursing does not change the energy or outcome of the game. It changes the energy in my house as I yell and scream, my other half calls out from the other room, “Are you okay?” To which I reply in a frustrated tone, “I’m fine, thanks; watching the Red Sox and *#%! *#!Pedroia just blew a double” or some variation of that response. Like any fan, I have my favorite players. David Ortiz is one. I want Big Papi to hit one out of the park every time he is up at bat. Of course, this is not possible. Doesn’t stop me from hoping. I fancy myself as Big Papi’s hitting coach, a cross between June Cleaver and Bobby Knight. I start by cajoling him. “You can do this,” I coax as I channel my best June Cleaver voice encouraging Wally or the Beaver. He swings, he misses. “Shake it off,” I implore. “C’mon you’ve got this.” Strike 2. It’s 3 balls – 2 strikes. “If you can’t hit the ball, take the walk,” I plead. He hits a grounder, out at first. Fortunately, there are no chairs around for me to throw. I turn and storm away from the screen, sputtering, “what were you thinking, you left two men on base.” Turning back I see a dejected Big Papi in the dugout beating himself up. We both know he’s a better hitter than that and we’ll both be ready to assume our positions the next time he’s at the plate, he the designated hitter, me the armchair hitting coach. 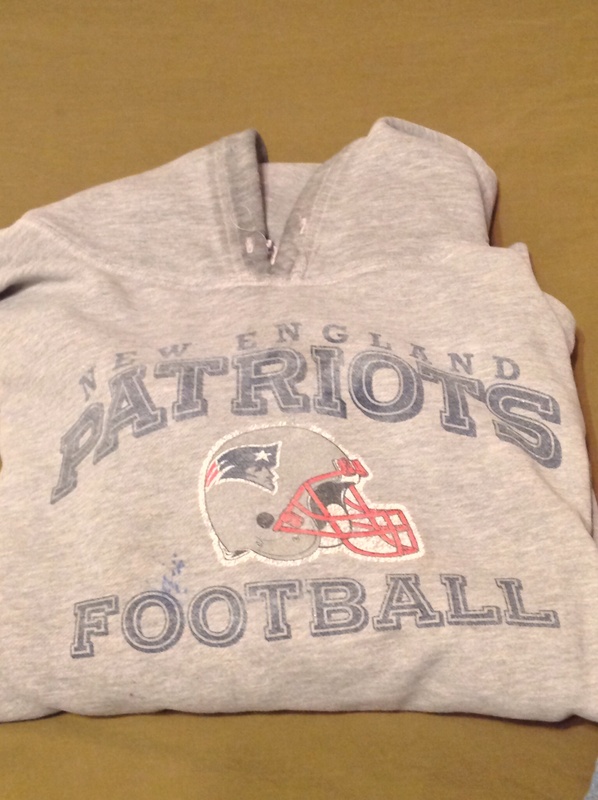 My freshly laundered Patriots’ hoodie. Sports superstitions come in many forms and are embraced by fans and players alike. Some believe if they wear their lucky shirt, shorts or hat their team will win. Usually lucky garment superstitions are based on that one time a fan or player didn’t wear their lucky garment and the team loses. It will be a long time before, if ever, that the player or fan doesn’t wear their lucky garment. This is one of my sports superstitions, which I apply only to the New England Patriots. I have my favorite grey Patriots hoodie, well-worn and comfortable. I’ve been wearing it for years on game day and this past Sunday I did not wear it; it was in the laundry. The Patriots lost to the Jets 30 – 27. Just saying, my hoodie may have contributed to the loss as much as the controversial call for unsportsmanlike conduct on Patriot’s defensive tackle Chris Jones. Pretty sure next week against the Dolphins, Jones will remember the new NFL rule prohibiting players from pushing teammates on the line into the offense and I will be wearing my grey hoodie. It’s not just fans that get caught up in the lucky garment superstitions, players can get caught up in it as well. Notably, Michael Jordan was into the layered look. A member of the 1982 national championship team from University of North Carolina at Chapel Hill, MJ reportedly wore his Tar Heels’ basketball shorts underneath his Chicago Bulls’ shorts throughout his career. Red Sox catcher, David Ross, wears socks adorn with the American flag on his left foot and the stars from the flag on his right foot. The one time, he messed up, the Sox lost the game. I hope Ross double checks those socks before each of the World Series games! Food or more specifically what food is consumed on game day is another common form sports’ rituals or superstitions take. Like, the lucky garment superstition what usually occurs is that a fan eats say buffalo wings every game day (because it’s one of his favorite foods) and on the one day that he doesn’t have buffalo wings his team loses. It’s the wings. The fan’s favorite buffalo wings are now his lucky buffalo wings and will be served on every game day. Players have also been known to have their food rituals. 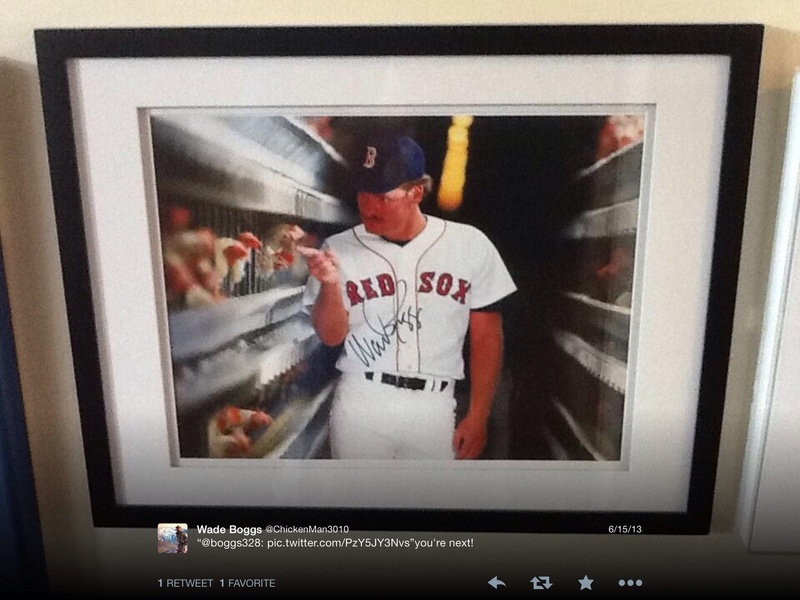 Former Red Sox third baseman Wade Boggs earned the nickname Chicken Man from former teammate Jim Rice, because he ate chicken before every game – one of Boggs’ many rituals and superstitions. Another noteworthy player superstition is the growing of beards in post season. The Red Sox this year started the group beard growing early in the season. The team’s beards have galvanized the team and the fan support around them. The franchise has held Fan Beard nights where tickets sold for a $1 to any fan if they sported a beard, natural, fake, painted on, tattooed, any beard would do. The team slogan for the season has become Fear the Beard. I’m sure many of the players would love to shave, but we are in the midst of Beardtober and what promises to be a great pennant race. To shave at this point would be inviting the wrath of the sports gods. My most prevalent sports superstitions involves how and if I watch a game. My schedule is pretty hectic and I don’t often get to watch a game live or on TV. Most of my sports viewing is done from my smart phone, IPad, or sometimes both at the same time. So if my team is on a winning streak and I haven’t watched a game, I will not watch a game even if I have the time. I will continue “watching” the game via Yahoo Sports and Boston.com, hitting the refresh button incessantly. I do not want to be responsible for breaking a winning streak. 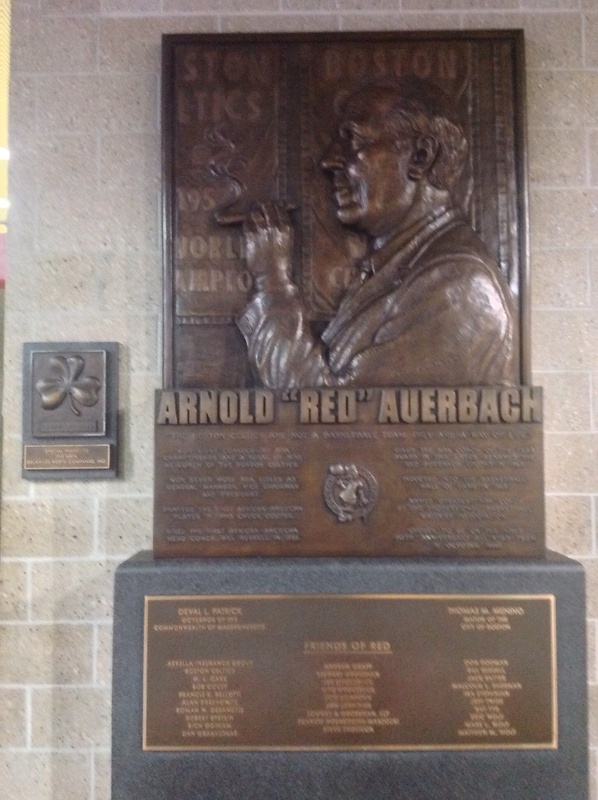 Another one of my superstitions involves the Red Auerbach shamrock located in the Red Auerbach Concourse that serves as waiting area for North Station commuter trains beneath what us locals call “The Gahden.” I commute in and out of North Station on a daily basis and this is a relatively new superstition that started for me during the Bruins run for the Stanley Cup in 2011. 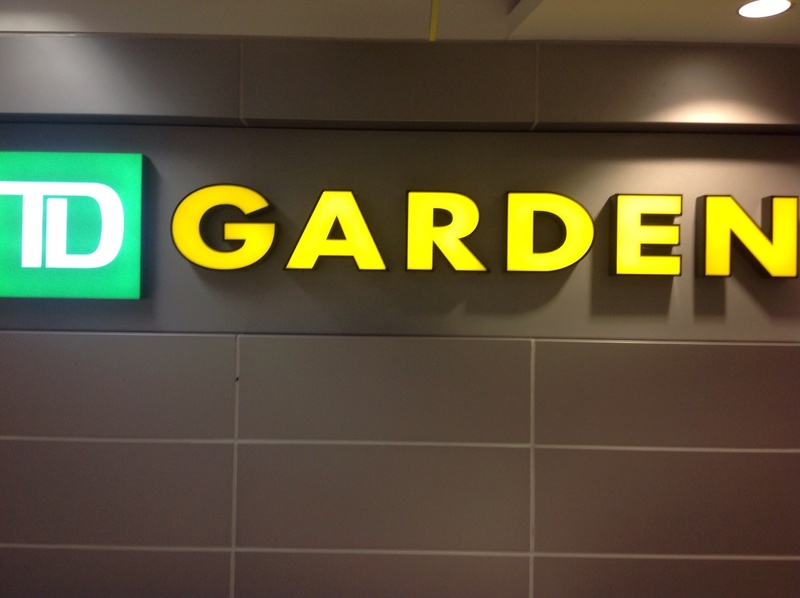 If the Bruins or Celtics are playing in “The Gahden” that night, I must touch the shamrock for good luck (unless I am not passing through); during post season it doesn’t matter whether the game is being played at home or away, I must touch the shamrock. My obsession with the luck of Red’s shamrock has now been passed onto the Red Sox during this post season. A little extra luck never hurt anyone. I think that sports superstitions may be genetic. Okay, I’m not entirely serious, but superstitions may be passed from generation to generation. Last basketball season as I’m leaving my house to go to my niece’s game, my 12-year-old niece, my goddaughter stops me dead in my tracks and tells me I have to change outfits. When I ask what is wrong with what I have on, she replies, “It’s green. Your sweater is green. We are playing the green team … you can’t wear their color, you’ll jinx us.” I immediately do what any good aunt and avid sports fan afflicted with a healthy dose of sports superstitions would do, I quickly change my sweater. My niece’s team went on to beat the previously undefeated green team that afternoon and I never wear the opposing team’s color to her games. Incidentally, the green team only lost one other game last season – to my niece’s team in the championship game. It has been my experience and observation, that my sports superstitions and those of others intensify during post season. The stakes are higher than during regular season. There is a certain frenzy in the air. It is do or die time. That is what makes my last sports superstition so vitally important. It is one I share with many of my fellow Boston sports fans – DO NOT under any circumstances plan and announce the celebration before the team has actually won the prize. So, please Mayor Menino, please learn from the error of your past ways and do not make any public announcements regarding any Boston sports team this October.